When I use this soap I can’t help singing the song “Put the Lime in the Coconut” in the shower. I will say that this soap from Mountain Ocean Natural Health Products had me feeling a few different soap vibes, some kind of weird Soap Trip (non hallucinogenic). It sent me back to when I was a teenager hanging out on the beach and smelling all those girls lathered in their Coconut Sun Tan Oil. 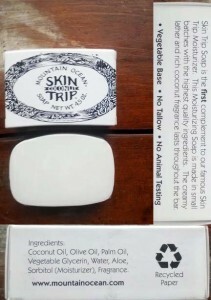 At first touch this soap feels very oily, so oily in fact that that when you read the first 3 ingredients, Coconut Oil, Olive Oil, Palm Oil, you end up realizing what a good soap should be like. In the shower this Coconut trip did not disappoint. Super moisturizing, super lather, all Glycerin, all Natural, all you. What is really nice about glycerin soaps is how clean and non offensive they feel. If you are allergy prone to soaps, pure clean glycerin might just be your kind of Soapy Skin Trip. COCONUT OIL – Coconut Oil is an excellent moisturizer and helps keep connective tissues strong and supple. OLIVE OIL – Natural oil used as an emollient in soaps, cleansers and shampoos due to its copious, small bubble lather. PALM OIL – Used as surfactant, emulsifier and texturizer in shampoos, shaving soaps, and creams. VEGETABLE GLYCERIN – Derived from Palm oil, vegetable glycerin is a humectant, mild emulsifier, emollient and moisturizer. ALOE VERA – Aloe Vera is nature’s gift to the skin. It has been used for centuries as a soothing and healing aid for skin problems. SORBITOL – From berries. Sorbitol works as a stabilizer and give lubricious feel to the lotion. FRAGRANCE – A light scent of coconut.